Roxy Palace Casino is a nice place to be if you’re a blackjack fan. With nearly 40 different blackjack and 21 game varieties to choose from, any fan would be satisfied. This is alongside the 300+ other games offered here! As usual for a Microgaming powered casino, the bonus system isn’t blackjack friendly, but as we all know, you don’t need bonuses if you’re good at blackjack! 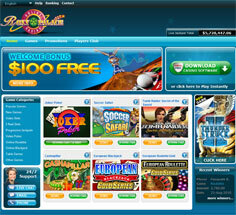 Microgaming is the company responsible for the downloadable software suite at Roxy Palace Casino. They have put together yet another fine software suite for this casino. The game selection really shows off the capabilities of the software – from the high-resolution graphics to the fully digital sound effects, everything is very impressive. The download is quick and painless, and the installation process is quite easy. 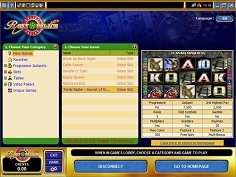 Or, if you prefer, you can play instantly online via the Flash-based casino – that way you don’t have to install anything, so you can enjoy your favorite casino games anywhere you can get online! 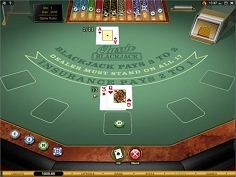 Now for the important part – almost 40 different blackjack games! There are just too many for us to list here, but you can look forward to great variations like Atlantic City, Big Five, European Gold, lots of Multi-Hand varieties, Triple 7’s, Vegas Strip, and more. You’ll find all rule sets here – with and without surrender, single deck games and 8 deck games…the works. There might even be a few variations you’ve never played before, so check it out. In addition to blackjack, you will find a ton of other games at Roxy Palace Casino. They offer dozens and dozens of reel slots, video slots, and progressive jackpot slots, plus almost 50 different video poker games, and a great selection table games. The library pretty much covers the whole spectrum of what anyone would hope to find at an online casino. This means if you ever need a break from your backjack madness, you will have plenty of other games to choose from as a member of Roxy Palace. The startup bonus at Roxy Palace Casino is up to £350 on the players’ first two deposits. Of course, blackjack games only count between 10% towards the playthrough requirements for this bonus (and Classic Blackjack just counts 2%), so if you’re here just for blackjack, you might as well opt out of this bonus, it won’t do you much good. Beyond this, there are lots of promos and bonuses running every week, many of which are great for blackjack players. The newsletter you can sign up for tells you all about them. Finally, the Players Club is a great loyalty program, but again, wagers at Blackjack games barely earn you any points, so it’s not much good either. Roxy Palace Casino has a great selection of blackjack games, but the casino is not blackjack-friendly when it comes to bonuses and the loyalty program. It is nonetheless a great casino, and a good blackjack player doesn’t always need these bonuses anyway, and casinos know this! Roxy Palace is an excellent place for any player to quench their thirst for blackjack.